Video tutorial on login and creation of a new sample in Sample DataStore. Another, a bit more detailed, explanation how Sample DataStore searches work. Sample DataStore v. 1.0.36 has been released. It provides many improvements and new features, e.g. Drag & Drop interface for tables. Now, you can simply drop files on sample history to append the file to the sample's record. Sample DataStore System Tray application allows for automatic deposition of experimental data into Sample DataStore system. Once installed, it constantly watches selected folders. In case a file has been copied to the folder, the application will deposit the file into Sample DataStore system, in appropriate sample folder. Video introduction to X-Ray Diffraction (XRD) Nano Processor Demo. This web application allows for Drag & Drop processing of nanopowder (nanocrystalline) diffraction data and obtain grain size distribution in few seconds. Commentary on diffraction theory used for processing the XRD data. Video introduction to X-Ray Diffraction (XRD) Nano Processor Demo. This web application allows for Drag & Drop processing of nanopowder (nanocrystalline) diffraction data and obtain grain size distribution in few seconds. Commentary on assumptions and limitations while processing the XRD data. Video introduction to X-Ray Diffraction (XRD) Nano Processor Demo. This web application allows for Drag & Drop processing of nanopowder (nanocrystalline) diffraction data and obtain grain size distribution in few seconds. Commentary on band and coherence distance parameters of the XRD data. Video introduction to X-Ray Diffraction (XRD) Nano Processor Demo. This web application allows for Drag & Drop processing of nanopowder (nanocrystalline) diffraction data and obtain grain size distribution in few seconds. Commentary on sharing results of processing of the XRD data. Few example of data processing with X-Ray Diffraction (XRD) Nano Processor Demo. Good data and success story is shown in this clip. Example of processing bad data with X-Ray Diffraction (XRD) Nano Processor Demo. The routine should break calculation to avoid seriously incorrect conclusions. 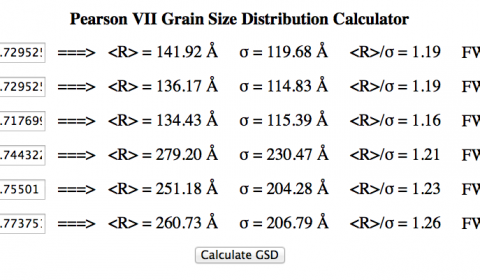 Method FW1/4/5M allows for quick Grain Size Distribution (GSD) calculation. You need to specify two peak widths: measured at 1/5 and 4/5 of maximum of the diffraction peak (FW1/5M and FW4/5M, respectively). The metod takes into account only size-broadening of the diffraction maxima.